A pair of belted tire for M-chassis, pre-mounted on wheels with soft foam inserts. 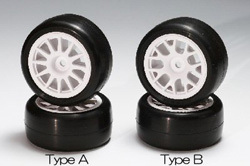 2 styles of wheels are available. Choose from style A or B. A pair of belted tires for M-chassis. Medium foam inserts for Kamikaze-slicks tires or low rib wheels. Product includes 4 foam inserts. Soft foam inserts for Kamikaze-slicks tires or high rib wheels. Product includes 4 foam inserts. A pair of wheels. Click the photos to see a larger images. About "offset", click here for more information. Click photos to see larger images. About "offset", click here for more information.